I understand where you're coming from, and I agree that a common web browser experience across all devices would be a good thing. The good news is that you're not stuck with the web browser that comes standard on your mobile phone, iPad or Android tablet. The iPhone comes with a mobile version of Apple's Safari browser, which should be familiar to folks who have an Apple Mac or MacBook. Android phones have a browser that's cleverly named "Browser". It's not Google Chrome, as you might expect. The real surprise here is that both iPhone's Safari and the Android mobile browser are based on the same open-source WebKit code. These no-frills default browsers get the job done, but there are alternatives for those who prefer something different, and for those who seek a mobile browser that affords some of the comforts of the familiar desktop browser. 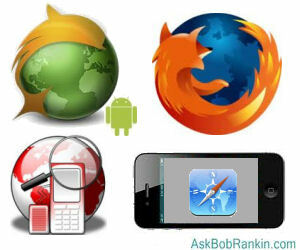 The Dolphin Browser HD is probably the most popular alternative browser for Android phones. It offers a lot of bells and whistles in the basic package, and it is extensible with a large number of addons. Add-ons let you view PDFs, adjust the theme, manage passwords, and more. The Mini version of Dolphin is a stripped-down browser optimized for speed. There is also a version for tablets although it's still in beta testing. Firefox for Android has many of the features that desktop Firefox users love: tabs, an extensive addon library, and the ability to sync your bookmarks and passwords so they're available wherever you go. It also has geolocation built in, so you'll get more relevant search results when you're out and about. Firefox can share pages with other apps and even use desktop add-ons. One feature you might like is the ability to swipe to the left and bookmark a website with one touch. On the downside, it needs a powerful processor so it may not be suitable for lower-end Android phones. Also, some users find that with Firefox mobile, it's difficult to tap a link and open it. I confirmed this on my new dual-processor Droid Bionic. Sometimes tapping a link did nothing at all, even when the screen was magnified. Sometimes it just highlighted the link, but didn't open it. Usually, repeated tapping would open the link. I found this annoying enough to rule out using Firefox on my smartphone, even though it offered the feature I wanted most - syncing my bookmarks and passwords across the desktop and mobile divide. To be fair, lots of people seem to love Firefox for Android, so this may be a hardware issue that affects only certain devices. Opera Mobile and Mini are also bandwidth savers. Web pages can be routed through Opera's servers where they are compressed before being delivered to your phone. The mobile versions of Opera include desktop amenities such as Speed Dial. SkyFire uses a compression scheme similar to Opera's. It also includes social features such as the ability to "like" a Web page with a single click on the SkyFire menu bar. Its Popular Pages tab shows you at a glance what content is most read within your social circles. There is also a feed reader that consolidates feeds from Facebook and other social networks. The Miren browser for Android is a lean, mean app built for speed and simplicity. A handy bandwidth saving feature loads only the text from Web pages, something you'll appreciate if you are paying by the megabyte, or your connection is very slow due to a weak signal. Another feature allows downloading of files only when on WiFi. This can save your bacon if your cellular data plan is metered. You might assume that since Firefox is available for Mac OS X desktops and laptops, that there would be "an app for that" on your iPhone or iPad. Unfortunately, there is no Firefox browser for iOS devices. There is an app called Firefox Home, but it's not a web browser. Firefox Home is a convenience app that may still be useful for iOS users, because it gives convenient access to your desktop Firefox bookmarks, history and tabs. This can save you time when typing (or trying to remember) the URLs for websites that you've visited on your desktop. Alternative browsers for the iOS platform (iPhone and iPad) include iCab Mobile. It features tabbed browsing, a download manager that helps you transfer downloaded files to your computer, Dropbox online storage integration, full-screen browsing mode, lots of extensions, private browsing, and more. Opera Mini runs very well on iPhones and iPads. In fact, in the App Store description for this app, they call it "the fastest, most cost-efficient web-browsing experience for your iOS device". Interesting features include a data usage meter, predictive typing, domain suggestions, auto-correct and instant bookmarking by tapping the star in the address box. Mercury includes many of iCab Mobile's features, including Dropbox integration, plus more. Ad blocking is in there, along with the ability to fool Web sites into delivering the desktop versions of pages if you don't like the formatting of mobile versions. There's a SkyFire browser for iPhones and it's one of the few ways in which you can view Flash movies on an iPhone. Not all Flash-dispensing Web sites are supported by SkyFire, but many are. This browser also supports sharing on Facebook and Twitter. So when it comes to mobile browsers, you do have choices. But there's still no perfect solution to the "same browser across all platforms" wish. If you're a PC or Mac desktop user with an Android device, the Firefox browser comes close. The caveats here are sluggish performance and the "tap to open links" problem I mentioned above. For Apple-only users, I'd recommend sticking with the standard Safari browser on both desktop and mobile. The downside is that Safari on the iPhone lacks tabs, but tabs are present on the iPad. Opera actually seems to come closest to providing a seamless browser experience across desktop, Android and iOS mobile devices. It is available for both Windows and Mac, but it has such a small market share, that I wonder about its long-term viability. Most recent comments on "The Best Mobile Phone Web Browser?" I've given up on "one browser to rule them all". The basic experience on the various platforms is different enough that different browsers aren't a problem. So: on my android phone and tablet I use the native browser and opera mobile, on my laptop I've got chrome, firefox and IE. I prefer firefox on Linux. And then there's Amazon's basic browser on the kindle Touch. I don't understand why I'm not more confused . I've been a Firefox user for years, and wanted to sync bookmarks so downloaded Firefox when I got my Android smartphone in December. It was so very slow, though. After seeing several favorable mentions. I downloaded the Boat browser. So far it has been much faster and has done what I needed. Just for the heck of it today I installed Orweb v2 on my Android phone. I was using Opera. Opera is faster, by quite a bit. Orweb is a Tor browser that won't keep your history. But I still find Safari lacking on the iPhone. One new alternative I've found is a browser called Knowtilus. It has tabbed browsing, plus a lot of extra features: translation, social media, RSS, text to speech, bar code scanning, sketching, etc. I haven't had it long enough to give it a full recommendation, but it seems promising. Overall, there are a lot of interesting browser options in the app store. I'm not as familiar with Android. Opera has been around for many many years, and whilst it has always had a small market share, its cult following has always been strong (seemingly largely populated by nerds like ourselves). Its a great browser, and if I didn't prefer Dolphin HD (lastpass is a must for me) and hadn't fallen in love with Chrome, I would still be using it today. Having just "discovered" Opera I'm hooked. Think it's the cleanest web browser going. My second choice is Chrome. Firefox is killing me with all it's updates. I use Dolphin almost exclusively. It's very fast and views my emails with no problems. I've tried the others but found them not to be tuned into Android. While playing Words With Friends one night, I took the bait and clicked on an ad for Opera Mini. Boy, am I glad I did. I downloaded it, and it's SO, SO much faster and better, on this particular phone at least. The site I was having trouble with renders just fine. Opera Mini also allows you to use tabs so you can have multiple web sites open at once. Almost makes me want to try it on my desktop computer. I have an iphone and ipad that I often use to browse the web. I have a Dell (not mac) desktop. What's the best "browser" for this configuration? I've been using google, began using Chrome when my daughter's public school started using Google Docs. Ideas?